KLM Royal Dutch Airlines, in partnership with the Schiphol Group, Delta Air Lines and the Port Authority of New York and New Jersey christened the first in a series of biofuel-powered flights between Amsterdam Airport Schiphol and New York’s John F. Kennedy International Airport on March 8. The flight of the KLM Boeing 777-200 also marked the beginning of a demonstration by Boeing and KLM of several advanced technologies aimed at improving operational efficiency, saving fuel and reducing noise and emissions. 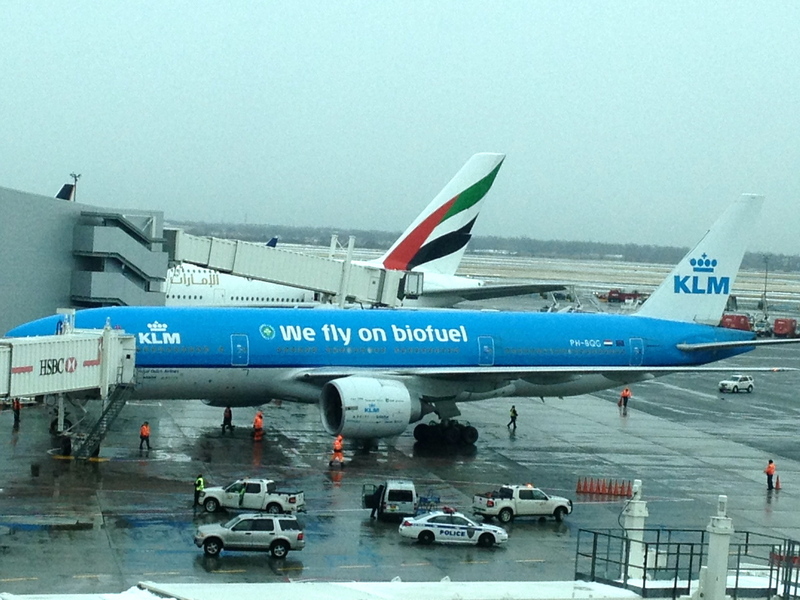 The biofuel flight series began with a ceremony at Schiphol airport’s E Pier officiated by Dutch minister of economic affairs Henk Kamp, KLM managing director Camiel Eurlings and Schiphol Group CEO Jos Nijhuis, among others. Program participants held another ceremony at JFK’s Terminal 4 before the return flight to Amsterdam. For the remaining 25 weeks of the pilot program, KLM will operate a flight between the two cities on Thursdays powered in part by a second-generation biofuel made from processed frying fat. SkyNRG, a company that KLM founded in 2009 with the North Sea Group and Spring Associates, is supplying the biofuel. The Port Authority of New York and New Jersey is providing ground fueling services and has dedicated two 10,000-gallon refueler vehicles to the operation. The KLM-Boeing technology demonstration, called “Optimal Flight,” combines all of Boeing’s current flight efficiency projects in a single program “to demonstrate the most efficient, environmentally progressive flight possible,” said Mike Caflisch, director of airspace programs for Boeing Digital Aviation Customer Solutions. Automated entry of flight-plan and performance data to the aircraft’s flight management computer and software applications that provide pilots with real-time weather advisories in flight and recommendations to optimize the aircraft’s speed will be among the technologies demonstrated. Based on the outcome of the project, Boeing and KLM said they will establish new operational procedures and recommendations for further development programs with partners including the National Aerospace Laboratory of the Netherlands, Delft University of Technology, JFK airport, the Nav Canada Gander and UK NATS Shanwick oceanic control operations and the Schiphol Group, which operates Schiphol airport.